There are a lot of recipes for chocolate bread pudding out there, as well as chocolate croissant bread pudding recipes, I’d imagine, but I think the difference in mine is that it’s not overly sweet. 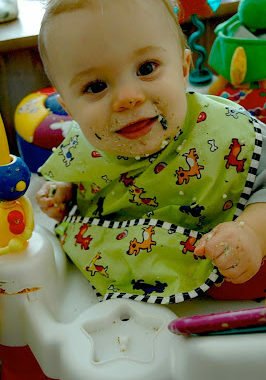 I like my desserts to have a good balance of sweet and salty, or at least not be too sticky-sweet. I only add a small amount of sugar to the custard because I think the croissants themselves have a slightly sweet flavor to them, and because the chocolate adds sweetness as well. I also recommend serving this with my homemade Mascarpone Semifreddo,* which will add more sweetness to the finished dish. Most semifreddos contain eggs, and usually they are separated and the yolks are beaten with some sugar and then later the egg whites are whipped and folded into the mixture. You end up eating the raw eggs, which usually doesn’t freak me out, but since I’m pregnant I would rather not ingest anything raw. So in place of the whipped egg whites that usually give this dessert its volume, I am using freshly whipped cream in its place. The cream combined with the mascarpone cheese produce a much creamier semifreddo and it was the perfect accompaniment to the Chocolate Croissant Pudding. It also was a heck of a lot easier to make! If you’re making this on its own, feel free to play around with different flavors and fold things in the whipped mixture like citrus zest, chocolate, fruit, nuts, anything you would love in an ice cream. 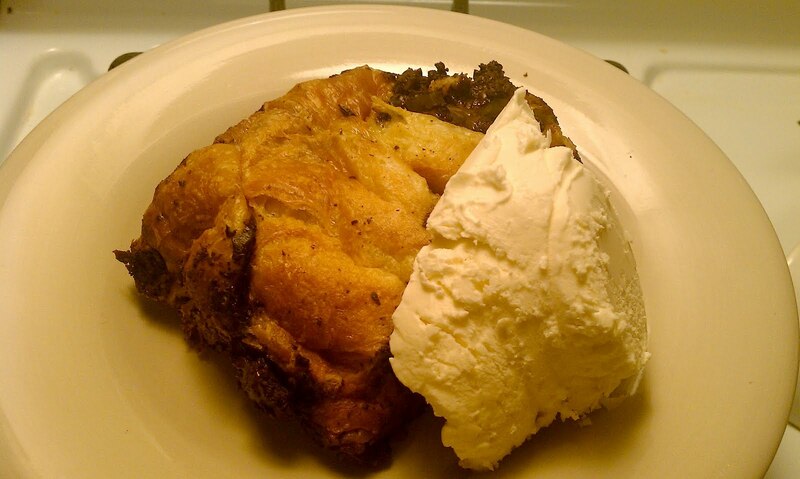 When making the croissant pudding recipe, please be sure to use croissants that are at least a day or two old. I would hate the idea of wasting a good, fresh croissant on this recipe. Plus, the staler the bread, the more flavor it will soak up. 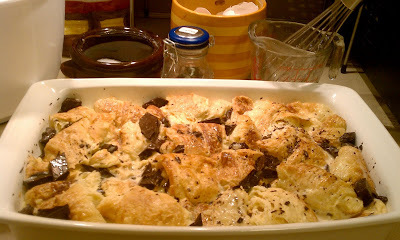 The croissant pudding can be assembled a day or two in advance and then kept in the fridge until you bake it. The Semifreddo can be made up to 3-4 days in advance and kept in the freezer. I served this for dessert when I hosted my family’s Christmas Eve dinner. We all thoroughly enjoyed it and I hope you do too. Cheers! -Grease a 9*13in baking dish very well and place all your croissant pieces into the dish. 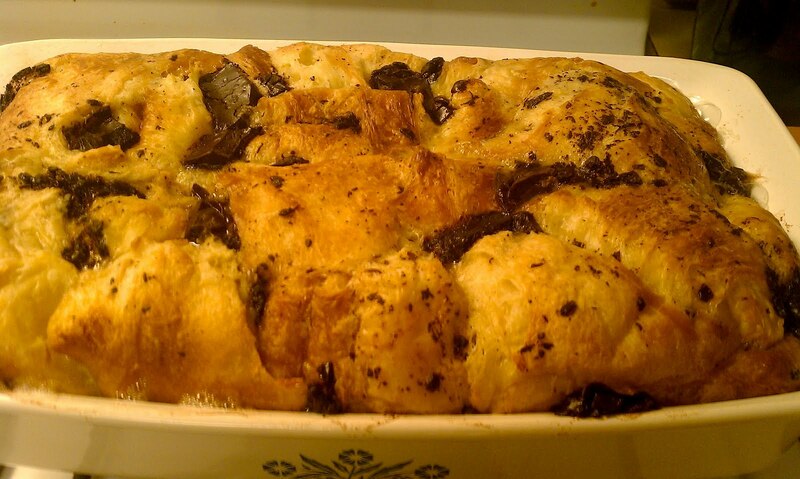 -Sprinkle your chocolate over the croissant pieces. 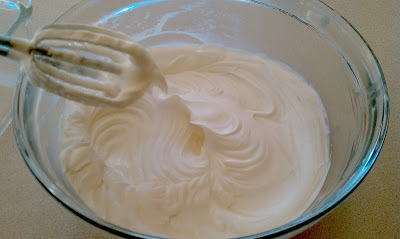 -In a large mixing bowl, whisk your eggs and add your milk/cream, sugar and vanilla extract. Continue to whisk until your eggs are fully beaten into the milk and the brown sugar has dissolved. -Season your custard with the nutmeg and salt. -Pour this evenly over your croissants and chocolate. With a spatula, press down so that every piece of croissant is able to absorb the custard. -Ideally, you should allow this at least 1 hour to soak in the fridge, but if you’re short on time you can simply soak it on the counter while you preheat your oven to 350, but be sure to keep pressing down often to speed up the process, as the croissants will continue to rise to the top of the pan. 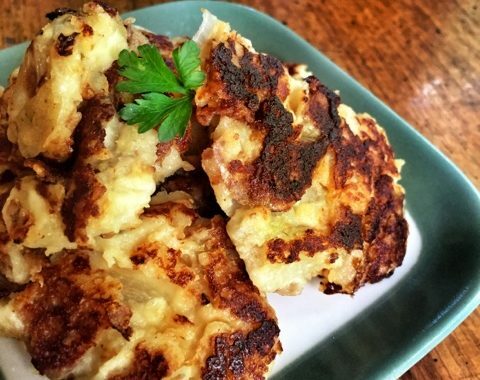 -Cover your dish with foil and bake 45 minutes, remove the foil and bake for another 10 minutes or so until it has puffed up, the top is golden brown and there is no longer a jiggle when you shake the pan. -When whipping cream, it is always best to place your whipping bowl and beaters/whisk in the freezer for a bit before you need it, just 10 minutes or so makes a world of difference in how well and fast your cream will whip. 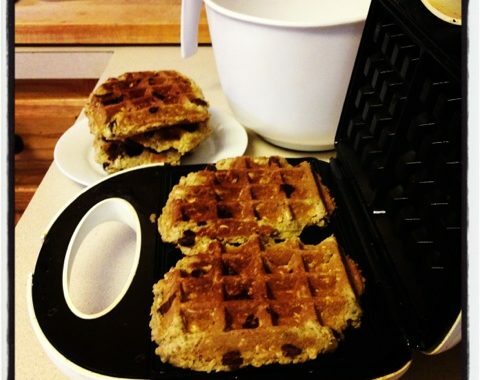 -If you plan on serving this alone, I recommend slicing the finished product. Therefore you would need to: Grease a loaf pan and line with plastic wrap, making sure there is excess hanging over to cover the mixture before placing in the freezer. Also be sure to smooth out any wrinkles inside the loaf pan, as the bottom will end up being the top. Place this lined loaf pan in the freezer while you make your filling. -If you plan on scooping this like ice cream (like I did for this occasion), simply place a loaf pan in your freezer while you make your filling. -Remove your mixing bowl from the freezer and add all your ingredients, beat everything together all at once (slowly at first so you don’t re-decorate your kitchen with powdered sugar) with an electric mixer until stiff peaks form. -Remove your loaf pan from the freezer and spread mixture into your pan, then cover tightly with plastic wrap, making sure the plastic is touching the whipped cream mixture, (this will prevent freezer burn). 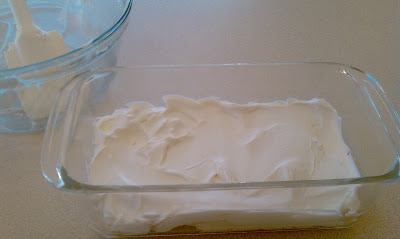 -Freeze for at least an hour, until the mixture is firm to the touch, very cold and the edges have hardened. -If you are slicing this, immerse the bottom of the loaf pan in some warm water to loosen it up, then invert it on a serving platter. -If you are scooping it, soak your ice cream scoop in hot water for a few second before scooping it out into your plates or bowls.